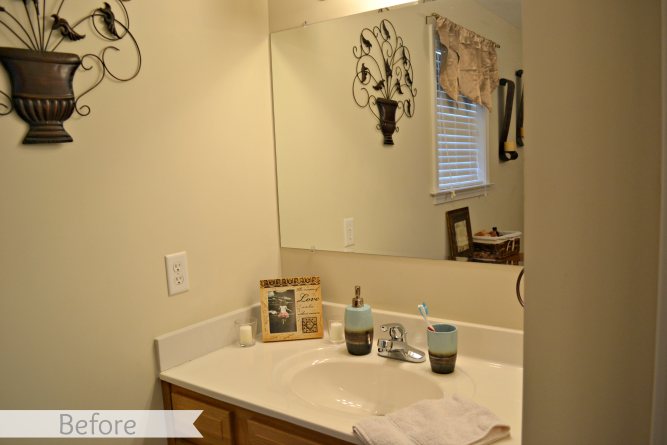 This bathroom felt drab and dark before. 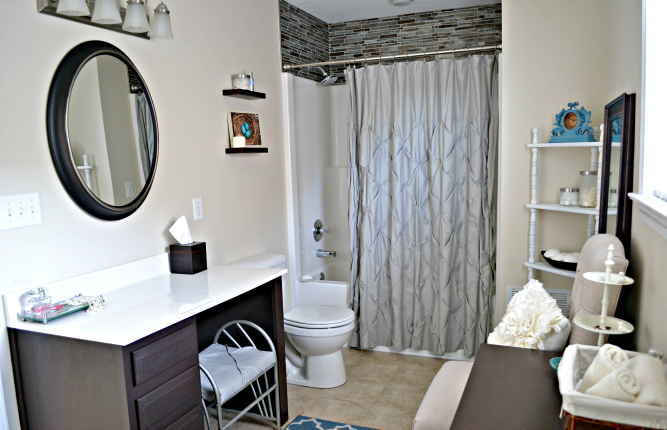 Now it is a bright, sophisticated space with the spa-like feel I wanted for our bath. The tile and dark mirrors and cabinets give the room its masculine bones while the ruffled curtains, frilly pillow, and elegant accessories provide feminine touches. Not only did I want the space to be the perfect mix of masculine and feminine, but I wanted it to flow nicely with the master bedroom. I unified the two spaces with matching rugs and similar pops of blue. The cabinets were a weekend project in which I removed the drawers and doors, sanded, primed, painted, sealed, and reassembled them. Whew! It was quite a job, but it was well worth the effort. The color I used was called Bracken which was a close match to the mirrors. I tried to be as budget friendly as possible by painting the existing cabinets, repainting existing furniture, and keeping elements like the lighting, flooring, shower unit, and counters. I absolutely love how the old and new all came together to create this space! Each morning I see this reclaimed wood sign that Jess from Nailed It Goods custom made for me! It reads, "I will be grateful for this day." It's a perfect way to rise and begin the day! Lydia Grace was my little helper. All the sanding and painting was really quite calming. When I do D.I.Y. projects, I feel close to my dad. These are the kinds of things I would have done with him. I painted, prayed, and thought of him. I still need to add knobs to the cabinets, but I just couldn't wait any longer to share the room with you. What do you think? *Affiliate links have been added to help guide you to the perfect products to complete your own bathroom remodel. I love it Jennifer!! You guys did an awesome job! Thanks, Cindy. That means a lot coming from you. 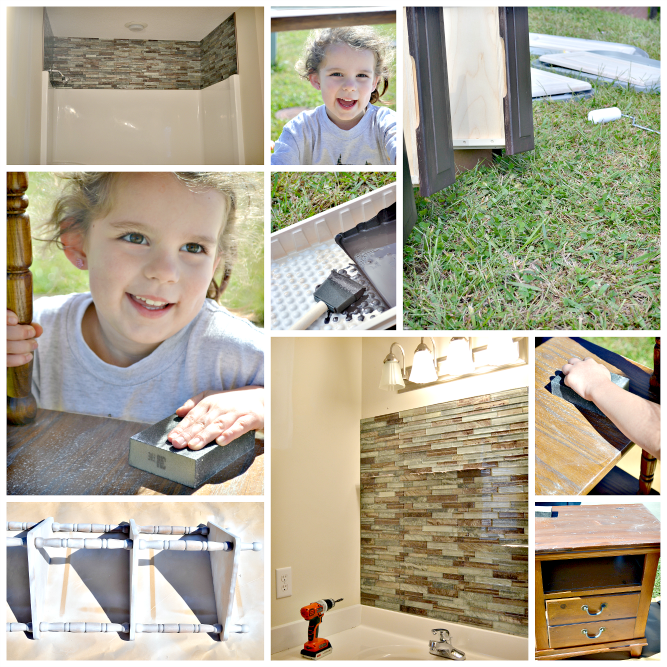 You have done some awesome DIY projects yourself. This looks great! You guys did an amazing job. I love the color scheme you chose...and the tile makes such a difference. Thanks, Luisa! 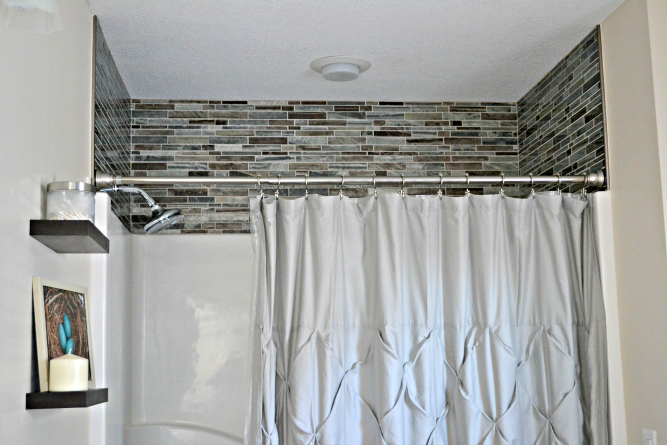 The color scheme was inspired by the tile itself. It really did make a big impact. P.S. Congrats on your baby boy! I'm so happy for you! beautiful! It looks so different from before! Thanks, Holly. It did make a huge difference. I am loving our home more and more with each new project. Oh my goodness, I love it! I just sent the link to my husband! 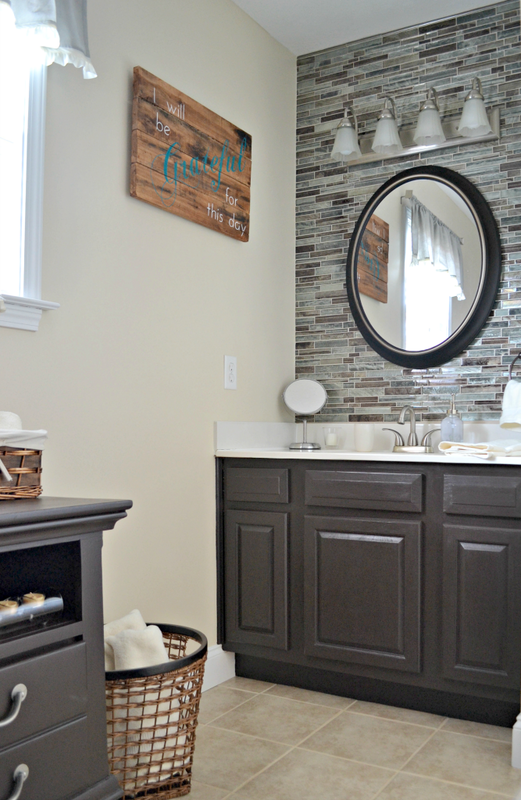 I've been wanting to do something new to our Master Bath and this just may be it! Thank you for the inspiration to get us going!! It's amazing! Awww...I'm so glad you like it! I'm very flattered! My own husband thinks it looks like a magazine which is really something coming from him. When I come up with these ideas, he doesn't always share my vision and "see" the finished product before it has come together. He completely trusts me though. When I started painting the cabinets, I told him, "There is no turning back now." Good thing he trusts me. i absolutely love that tiled wall. fabulous job. This is beautiful! You did an amazing job. I really love the tiled wall in your little sink nook. Way to make an awkward bathroom layout work for you! 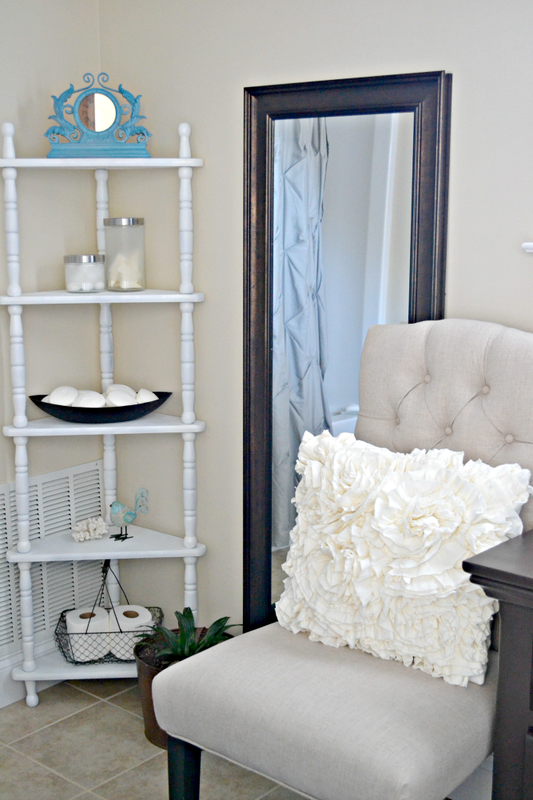 You've inspired me to try something similar in my house....or at least add it to the list, ha! Thanks! I knew I wanted to put tile around the shower, but I was worried that it would stand out too much. That's when I decided to balance the room by also going with tile on the opposite end. I'm so glad it gave you some inspiration for your own space. Thank you, Lisa! You are right. You drapes and my rug do share similar patterns. I bet that's why I loved your drapes so much. There is a larger version of this same rug in our master bedroom. It TOTALLY looks like a spa now. I love all the tile work and the color palette. Beautiful. Thanks! I really appreciate the compliments. Jennifer, I have such huge master bathroom envy! You did an amazing job, so lovely. I love that tile! And how you put it above the shower surround. Such an amazing difference in the room! Excellent remodel!! Thanks! Choosing tile was a challenge. I'm glad I went with this one because it really did make a huge difference and set the tone for the rest of the room. I appreciate you coming by and commenting! Such an improvement, Love it! I just painted the identical corner shelf for my mom's bathroom white! Thanks! How funny that we both had the same idea to paint our shelves white! Thanks, Ronda! It's a pleasure to have you visit! I LOVE this! Love thee back splash & color scheme. 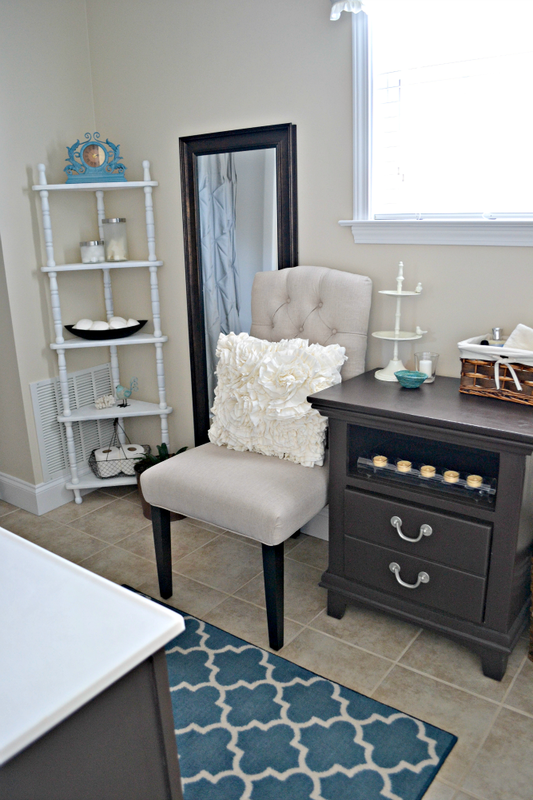 I love the accessories (chair, mirror), too! We're about to buy a house. The bathroom is outdated. I was looking on pinterest and such for some low-cost DIY bathroom updates. This looks similar to what I'd do. Thanks, Kim. I'm glad it gave you some ideas for your own space. Good luck with the house purchase. That is so exciting! Awesome!! That looks AMAZING! Great job!! Thank you, Morgan. I'm so glad you came by. That is gorgeous. 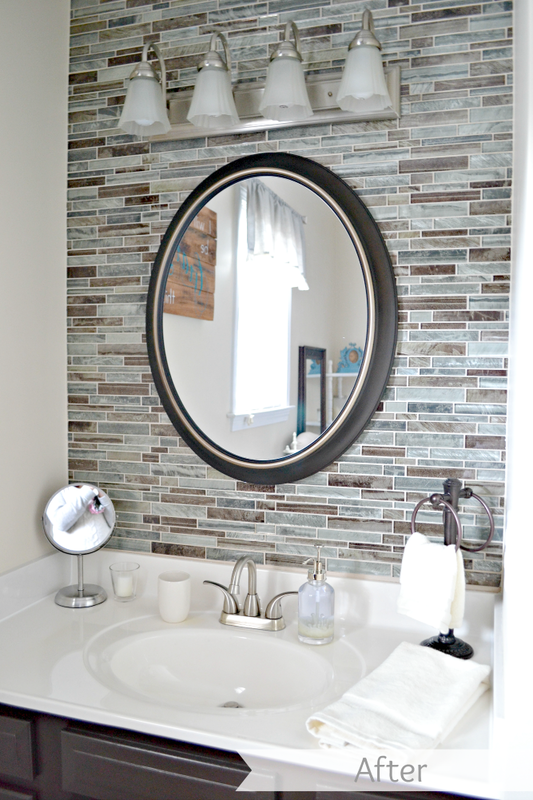 We're in the process of remodeling our downstairs bathroom, so this is giving me ideas! I'm glad it provided a bit of inspiration for your own remodel. Thanks for coming by! I love this! My favorite thing about it is the tile over the bathtub! 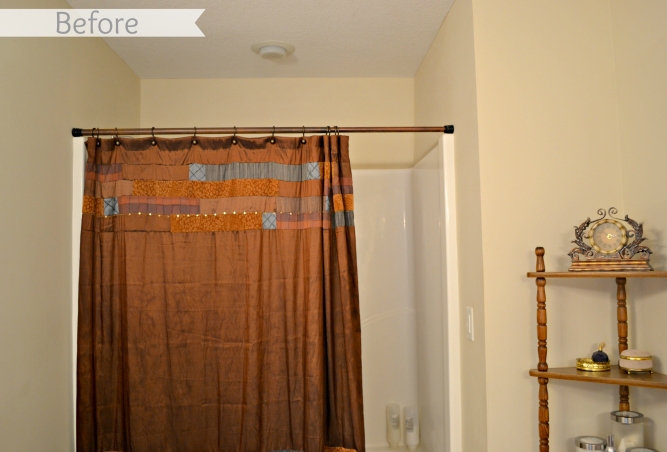 I would have never thought of filling in that little space with tile, but with the curtain closed, it totally looks like your shower is COMPLETELY tiled. Awesome! Thanks! We wanted to be as budget and eco-friendly as possible. Ripping the whole shower out was not an option, so this was the next best thing. Your bathroom looks awesome! Great job! 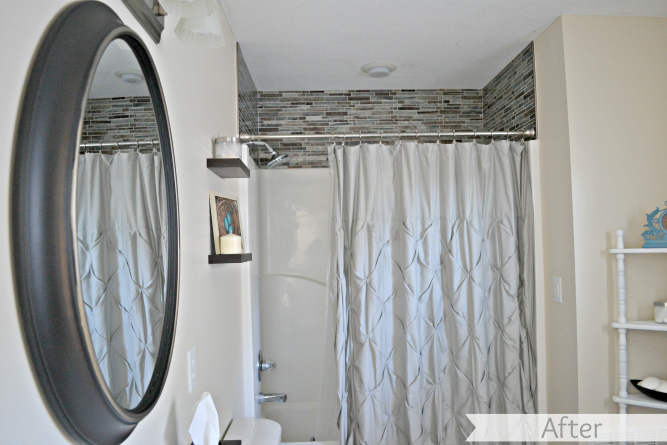 I would not have thought to tile above the shower but it looks amazing. Thanks, Tammy! You always do such amazing projects. Your sweet compliment has made my day! 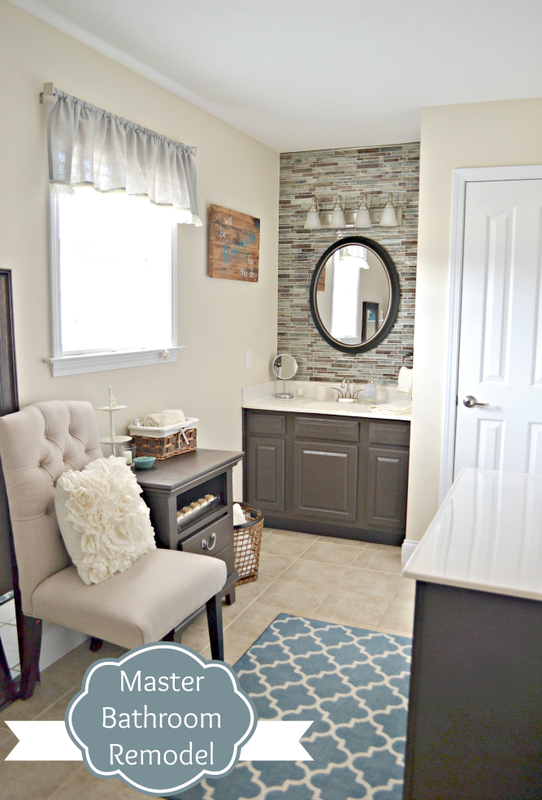 This bathroom remodel is gorgeous! I just love the colors! I came over from Sweet Bella Roos. I am in love with the wall behind your sink! That looks fantastic! This looks awesome! I love the tile choice. Using it behind the sink and the shower area really ties everything together. You picked the best colors for your bathroom. White, gray and rusty green compliment each other. Loving your bathroom and it's overall beauty. Looks fantastic! I just love this! 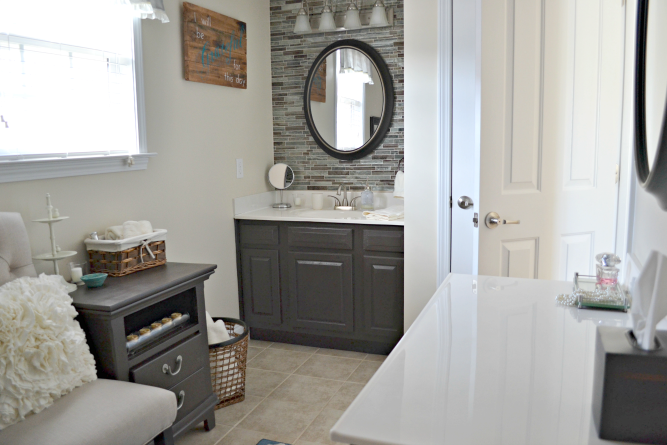 This bathroom remodel is gorgeous! I just love the colors!